Driver fatigue can often be an underestimated danger. Companies rely on their drivers for getting to remote job sites, product deliveries, and transporting goods between warehouses. Your fleet drivers may often have to take long trips and/or inconsistent driving schedules which then results in them driving tired. A study in the US focusing around this issue found that being awake for 17-19 hours straight causes impaired performance equivalent to a blood alcohol concentration of 0.05%. Companies rely on their drivers to be alert and safe and driver fatigue poses a threat. If there is an employee injury or accidents due to a driver being too tired it can cost millions of dollars in damages and potential lawsuits if a third party is involved. The need for technology to monitor this issue is increasing and some ideas have been circulating within the industry. Some of these ideas include heart rate detectors or eye scans to monitor driver fatigue. It is the responsibility of both the drivers and their fleet organizations to ensure best practices and safety when driving. This includes: strong recognition and decision making skills, being well rested, and always taking the correct steps when starting to feel too tired. Telematics technology helps to track the health and status of your vehicles and also helps managers better manage drivers; it is important to also consider fatigue. 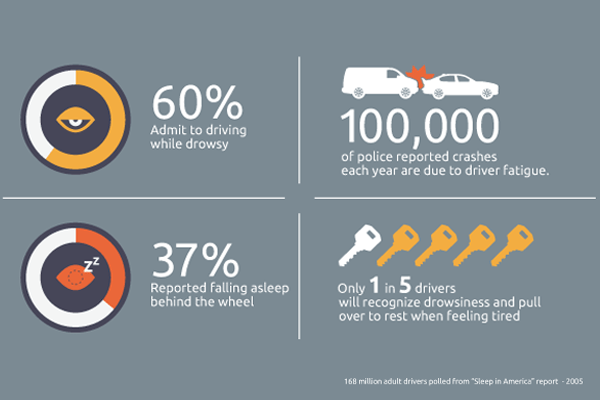 An overly tired driver is much more likely to get in a crash than a well-rested driver. Business and fleet safety managers must encourage their drivers to spot driver fatigue symptoms (like slow reaction time, trouble focusing etc.) and to stay off the roads when experiencing these symptoms. The consequences of accidents linked to fatigue have been found to be more serious because drivers in this state normally make little attempt to avoid the crash. Why Use ZenScore? What it is, How to Use it, & Benefits!